Step 1. Start with a background. Select desired colours for a base and keep in mind free space you want for the other elements. Proportions play a crucial part here. Purple and silver paper can be glued to the card, but I suggest we add details to the ivory paper first, before gluing it to the card, in case something goes wrong. We’ll glue this later once all the details are complete. Step 2. Now start the most tricky part in this card – names and animals. (we use ivory paper as a background – we glue as we go along here). Take extra time here and plan ahead. Look around for inspiration – I’ve found templates of dog shapes online (Pinterest is a useful resource) and used these to create our dog shapes. Text is also difficult as the letters in the names are very small and the paper strips have to bend properly so take extra precautions. Once names and animals are finished we can glue everything (shapes with ivory paper base onto the purple and silver piece). Step 3. 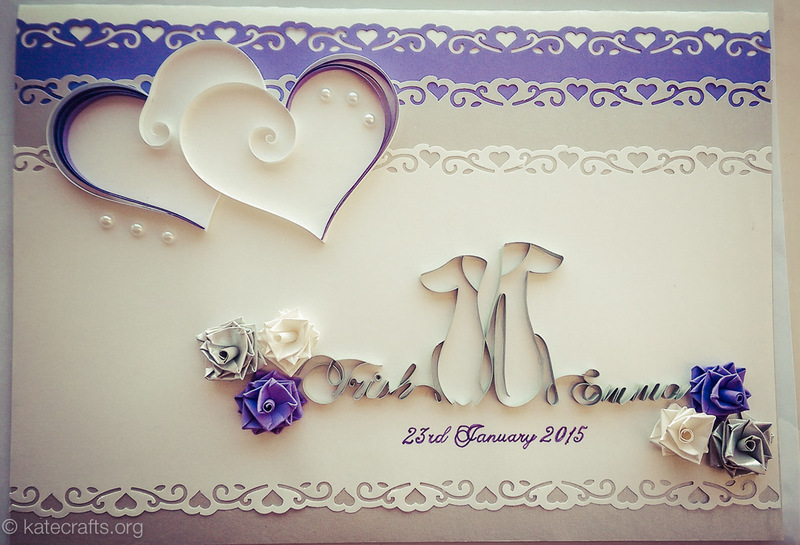 Next are the hearts: first cut out the shape of two hearts we want use from the ivory colour paper, next place them (with no glue yet) onto the card to decide in what place and how we want to put them together. Then take the same colour paper strip and glue it around the edges of the heart, leaving a little bit of unused paper so that you can make a swirl inside the hearts, make sure we have left a space to put one heart on another. Once that is done we can insert a few purple stripes inside of the heart to decorate it. Now we have the heart ready to place it onto the card, this time with the glue. Step 4. Detailed post how to make roses here. Thank you for your kind words. Glad that you like it!